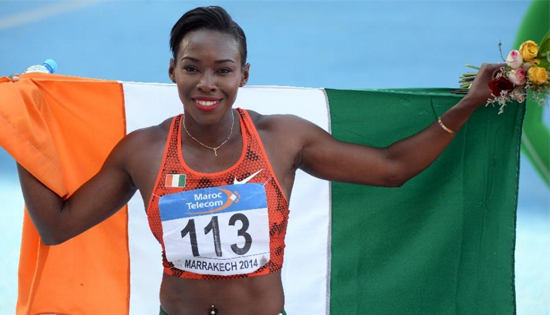 Murielle Ahoure of the Ivory Coast broke the African 100m record with a blistering 10.78sec Saturday at the Star Athletics Pro Meet in Florida. The 28-year-old's effort, in a wind of 1.6 metres per second, put her atop the world list for 2016 with the Rio de Janeiro Olympics beckoning in August. Jamaica's Veronica Campbell-Brown also broke 11 seconds, finishing second in 10.83sec. Ahoure eclipsed the African record of 10.79 set by Nigeria's Blessing Okagbare in in London on July 27, 2013. She improved her own personal best of 10.81, and moved moved past the 10.80 clocked by Tori Bowie at Doha on May 6 for the fastest time in the world this year. At the same meeting, American Marvin Bracy won the men's 200m in 9.94sec (wind 1.8m/sec).